Zofia Skórzyńska of the house of Radziwill titled her memoirs, Witness to a time passsed. So indeed the time has passed, witnessed to by parks without homes, or homes more or less rebuilt within manicured parks containing old, tall trees. Maybe it’s trees in particular that best indicate the passage of time and the flow of eras. They were planted with the idea of creating a landscape, a feeling of safety. People planted the most diverse trees, marked out alleys. One can still discern a rhythm to the trunks and branches. And in those parks, most often there would be a white house such as the one in Sichów Duży. We call the Sichów House a palace, though it is hardly that, built as it was in 1794 by the Potocki family, specifically the line of Jan Potocki, the historian known chiefly for his work, The Manuscript found in Saragossa. A seat was needed for the administration of the Staszów properties, that came into the family as Catherine Lubomirska’s dowry. These were uncertain times. Nearby Połaniec was being built. It was there that Tadeusz Kościuszko read the Połaniec Proclamation of 7th May 1794, and then prepared for his confrontation with the approaching armies of Catherine II. In France 5 years had passed since the revolution, and the young republic was entering its most bloody phase before it would be reborn as the Consulate and then the Empire. Many Poles served it, as also did a young aide, later General Stanisław Dunin-Wąsowicz. After the Congress of Vienna, the Sandomierz lands were divided, some governed by Radom and some by Kielce. The border between the annexations was along the Vistula. Sichów found itself in the district of Stopnica, under Kielce. 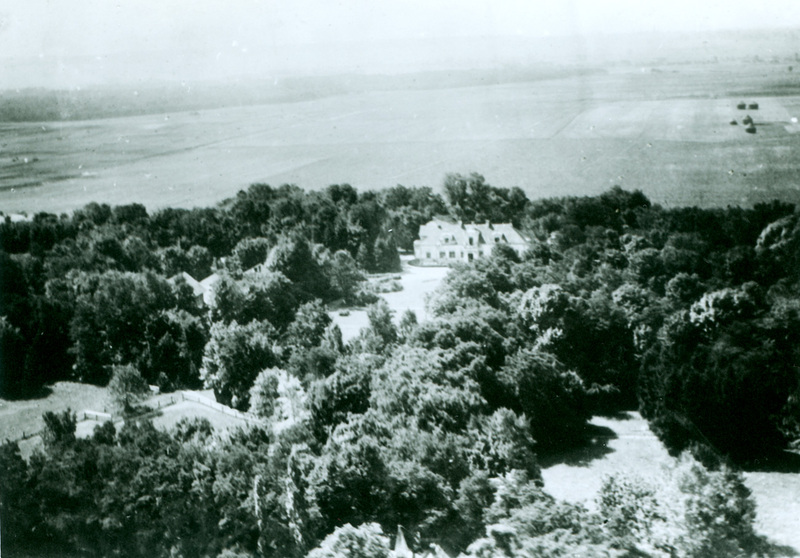 Kurozwęki, the property of the Sołtyk family passed into the Popiel family, who also lived in Wójcza near Pacanow. Kurożwęki would later become the home of Paweł Popiel,known as his Excellency, the founder in Poland of the Society of St. Vincent de Paul. The Popiel story and that of the closely related Rostworowski family was told in the 1970s by Emmaniel Rostworoski in Popiels and Roots. Fr. Rektor Konstanty Michalski, the eminent Thomist scholar whose portrait hangs today in the Sichów library, was also a missionary of the V- De Paul Society. Later he became a close friend of the Popiels and Radziwiłłs. The close tie with the Roman Catholic Church, active involvement with it, a belief in the rebirth of Poland and its significance, land husbandry, an interest in literature and the arts, would all permeate the families whose homes were scattered over the fields and woods of Kielce. The January Uprising sowed those fields and woods with graves. A nearby grave, in the Rytwiany woods, near the former Camaldolese monastery, testifies to a skirmish by Langiewicz who made his camp near Staszów in February 1863. In the homes of the landed gentry, there was concern mingled with the belief that they would define the appearance and views of the next generation. Only 50 years later they created today’s Polish state. Its principal world views had their origins in the underground state that arose then, and lasted almost three years. The end of the 19th century was important because for the first time a family moved into Sichów. Róża Potocka married Prince Maciej Radziwiłł, bringing the Staszów lands as her dowry. The Radziwiłłs chose Sichów as their family home from the beginning of the 20th century. Maciej, while carrying on multiple businesses in Warsaw, also found time to work with the local aristocracy on the affairs of the Kielce lands. Róża planted trees and established lawns in which she sowed violets, that grow there to this day. Their sons were born in Sichów — Krzysztof, Artur and Konstanty. Róża fell ill and travelled abroad for a cure. Thus the youngest of the Radziwiłł brothers, Maciej, was born in Nice, France. In nearby Wójcza and Kurozwęki, two Popiel cousins married two Mańkowski sisters. In the Pusłowski house, Czarkowy, Karol Hubert Rostworowski was a frequent visitor. Later he married Róża Popiel from Wójcza. The first few decades of the 20th century were vibrant with the development of culture, attracted by nearby Kraków. Warsaw is farther away, but it was there that there emerged the first signs of hope for a free Poland. Piłsudzki’s Legions moved rapidly through Kielce. The Marshal stopped in nearby Staszów for one night. Both the Rostworowskis and the Dunin-Wąsowiczes fought in the Legions, the latter falling in the famous charge at Rokitna. Later Artur Radziwiłł from Sichów fought in Piłsudzki’s army, when it reached Kiev in 1920. During the First World War, the Sichów Radziwiłłs left for Moscow where the sons edited the family publication, The Light of the West. In 1916 Krzysztof published, Poems, all available in the restored library of Krzysztof Radziwiłł in Sichów. Upon returning to Kraków in 1918 Krzysztof took part in disarming the Austrians in the marketplace. Along with his brothers and other sons of the landed gentry in the area they joined the Polish army. At his wedding reception he wore uniform. His wedding to Zofia Chościak Popiel took place on 23rd October 1923, but without his father Maciej who had died suddenly in 1922, and whose body is buried in the monastery at Rytwiany. After the wedding the Radziwiłłs moved into Sichów. They lived there until August 1940, when they were arrested by the Nazis and taken to concentration camps. Five children were born in Sichów: Barbara (Rej), Maria (Dunin-Wąsowicz), Zofia (Skórzyńska), Stanislaw Radziwiłł and the youngest, Anna Radziwiłł born in 1939. The children grew up in a home filled with love, concern for Poland and prayer. 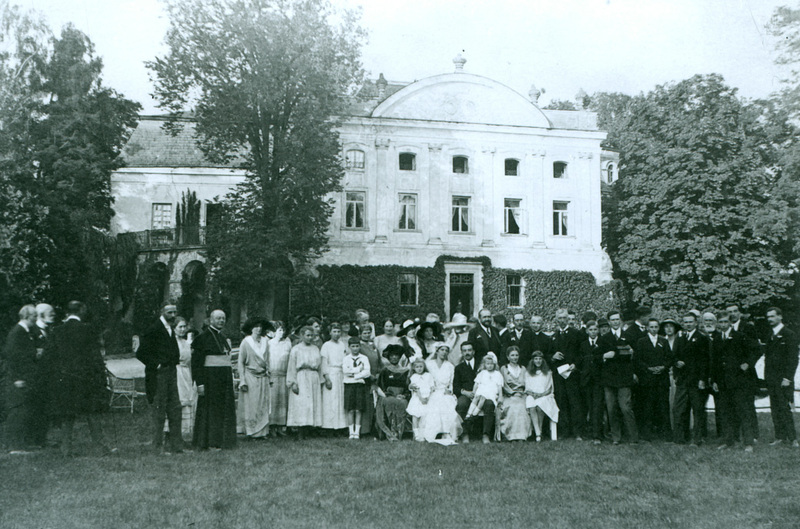 Among frequent guests were the Popiels of Wójcza, Popiels of Kurozwęki, the Rostworowskis from Krakow, the Tarnowskis from Dzików. Józef Mehoffer, the famous artist came to stay, painted portraits of Krzysztof and Zofia, and drew charcoal sketches of many of the residents of Wójcza and Kurozwęki. From the 1930s, Fr. Rektor Konstanty Michalski, already mentioned, was a frequent guest. Hunting and family gatherings took place in all the nearby homes. In September 1939 war violently interrupted the life of the young, Second Republic. The wehrmacht entered Sichów on 6th September, crossed the park, entering the house only for a moment. 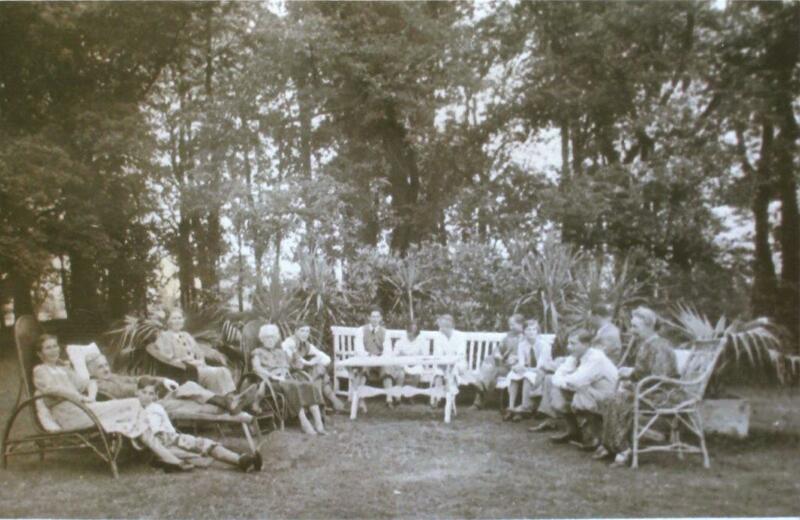 The Nazis returned later on 4th August, 1940, arrested Krzysztof and Zofia Radziwiłł, who were at the time hosting professors of the Jagiellonnian University who had just been released from Sachsenhausen: Szydłowski, Estreicher, Dąbrowski with their families, and Fr. Rektor Michalski. The children were taken care of by Konstanty Radziwiłł, Jadwiga Popiel and Fr. Rektor Michalski (see photo), and Krystyna Radziwiłł of Słupia. After the war, in which two of Krzysztof Radziwiłł’s brothers, (Arthur from Rytwiany and Konstanty from Zegrza), were killed only Krzysztof, who had survived the gehenna of concentration camps, lived on in Poland; in Warsaw His youngest brother Maciej Radziwiłł and his wife Krystyna formerly Dembińska,emigrated to California. Stanislaw Popiel from Kurozwęki also moved abroad. His son Martin, along with his wife Karen returned to Poland in the 1990s to rebuild Kurozwęki. 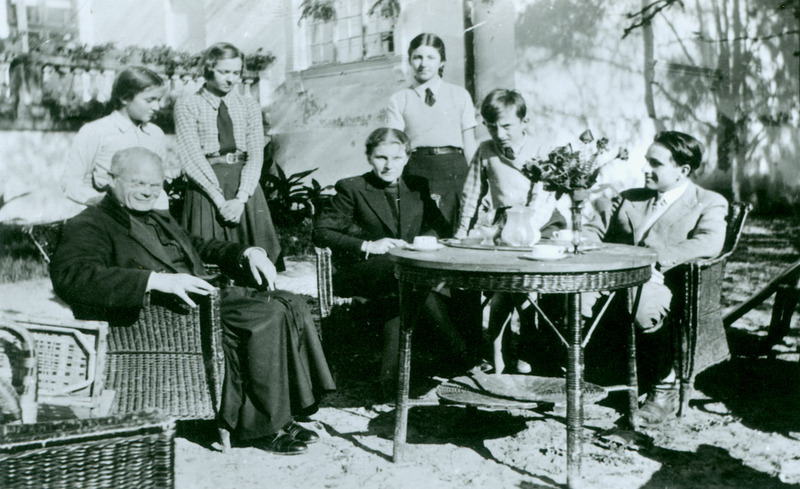 The Popiel family from Wójcza was scattered over different Polish cities and abroad. Paul, the son of Róża Kieniewicz from Wójcza, and brought up in Scotland, came to Poland after many years in the USA, along with his wife Amber, to live in Sichów. During the years of Poland’s communist government the Sichów house was occupied by an agricultural school. After the school’s closing it fell into ruin. Rebuilt in 2010 by Stefan Dunin-Wąsowicz, the son of Maria Radziwiłł, it is open to those wishing to see Krzysztof Radziwiłł’s library, reflect on changing identity, have a glass of local wine and to touch a fragment of time passed.